The Bali vacation package will start by picking up to you from the airport and dropping at hotel for check in. Since this will be your arrival day and you might not be having plenty of time left for the day. So, you can simply go to Waterbom Bark with our holiday tours to Bali. It is an action-based theme park with plenty of thrilling water rides making your day fun filled. By the evening, we will take you to the place where you will se such an amazing view of sunset that you would love to capture in your eyes forever. Tanha Lot temple, a well-known temple built on a rock half submerged in sea giving iconic view with cool breeze. Stay overnight in the hotel. Have your breakfast and after that the next destination of our Bali holiday tour would be Tanjung Benoa Beach. Try to reach the beach by morning 09:00 AM as thrilling water activities are allowed till 02:00 PM only. This exotic beach has plenty of water sports to enjoy like the Banana Boat ride Bali, Snorkelling, jet Skiing, Parasailing, Diving, Surfing and much more. By noon, enjoy the sun bath or ayurvedic massages. Get back to hotel, have lunch and take some rest. By evening get ready for the Uluwatu Temple tour or Pura Luhur Uluwatu tour which is a temple situated on the rock above 70 metres of the sea level. It also offers a picturesque sunset with sun dropping into the majestic Indian ocean. Stay overnight in the hotel at Bali. After having a healthy and delicious breakfast at the hotel we will head for further jungle safari and other water sport activity in Bali. Our Bali holiday vacation package will take you to the Bali Jungle Safari and Marine Park which will grant you a memorable and fun day. You will be allowed to visit the Jungle in a cage having a closer look to the wild life animals and habitation. The Jungle Hooper package will grant you the access to Fresh water aquarium with piranha and other marine species. You will also get the opportunity to watch plenty of shows like Elephant show, Animal Show, Bali Agung performance and water rides at the Water Park. Have a delightful stay at the hotel in Bali. The fourth day is the day to bid farewell to the islands of Bali. After having the breakfast, as per our Bali holiday vacation package you will be checking out from the hotel. Our representative will drop you at the airport after that. Since Bali is itself an island therefore it is all covered up with beaches and plenty of islands making it a perfect place to carry out plenty of water activities. If you ever found yourself in dilemma of where to spend your long weekend with plenty of plenty of water sports and activities then look forward to us. Our Bali holiday tour package offers you plethora of water sport activity in Bali that will take away the stress of your hectic lifestyle. 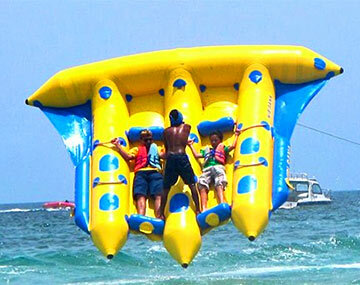 This 3 nights and 4 days Bali water sport holiday packages is inclusive of all i.e. cabs, hotels, tour guides, breakfasts, lunches and plenty of memories to cherish for. You not only get to have fun at beaches but also get to involve yourself in plenty of water sports at beaches. Furthermore, you can have an amazing day at Bali safari tour & Marine and Jungle Hooper package. Let us have a look at the detailed itinerary of our Bali holiday package with water sports. Expenses personal in nature like laundry, telephone calls, Drinks or any tips to driver etc. Bookings made with the incorrect age of passenger / passengers may incur a penalty at a later stage.